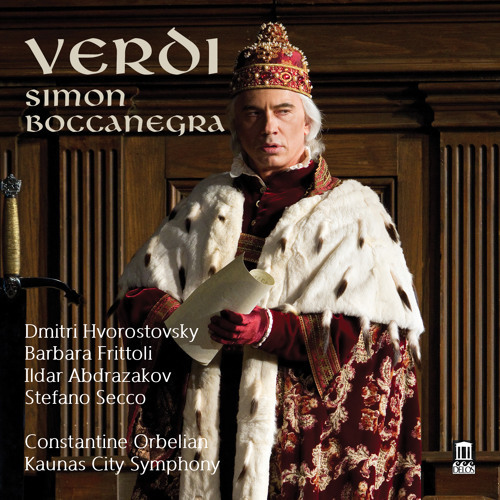 Music: Piango, perche mi parla Composer: Verdi Artists: Dmitri Hvorostovsky, Barbara Frittoli, Ildar Abdrazakov, Stefano Secco, Constantine Orbelian, Kaunas City Symphony Album: Verdi: Simon Boccanegra Label: Delos Productions DE 3457 Street Date: April 14, 2015 http://delosmusic.com Amazon: http://amzn.to/1GNhDHv iTunes: http://apple.co/1Gxuyiq Our first-ever full-length Italian opera recording, Delos’s star-studded current release of Giuseppi Verdi’s Simon Boccanegra promises to make quite a splash among today’s opera fans. As Verdi was entering his glorious “late period” (Otello and Falstaff) he wrote and re-worked much of Simon Boccanegra, a work that he had first tackled in 1857. The opera emerged in 1881 as a powerful masterpiece, although one that has been unfairly neglected, in comparison with Verdi’s other works on that level. So it’s high time for an authoritative new release of an opera that gives glamorous title star Dmitri Hvorostovsky – considered by many to be the world’s greatest Verdi baritone – the chance to record what he calls “…one of the most complex, deepest characters in the whole baritone repertoire.” Hvorostovsky goes on to say, in a special introduction he wrote for this album, that among his favorite scenes in the opera is the Council Chamber scene: “Simon’s address to the people, ‘Plebe! Patrizi! Popolo!’ is the creed of a great statesman. As he cries for peace and love, the whole crowd is swept along by the same surge of passion!” Joining Hvorostovsky in this very special studio recording are the kinds of all-star colleagues he deserves: soprano Barbara Frittoli as Amelia, tenor Stefano Secco as Gabriele, bass Ildar Abdrazakov as Fiesco, and baritone Marco Caria as Paolo. Constantine Orbelian, “the singer’s dream collaborator” (Opera News), leads the Kaunas City Symphony Orchestra (Lithuania) and Kaunas State Chorus.